The Nigerien government last weekend reacted to the massive deportation of its nationals by Algeria, in violation of the agreements between the two countries and of international conventions. Algerian authorities have deported about 950 sub-Saharan Africa migrants to Niger last week, according to officials and human rights groups. The North African nation has expelled 2,800 Nigeriens and 5,000 West Africans in the last two months. 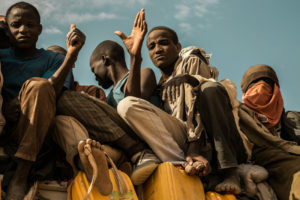 The Nigerien government, which expressed its “concern” over Algiers’ mass expulsions, expressed hope that the two countries, which share a common border of about 1,000 km, will define a more precise framework for managing migration. Algeria has often sent migrants back to Niger since 2014 as the number of people taking the dangerous route to Europe from West Africa swelled. The latest groups of migrants included people from across the region. Beyond the deportation, the authorities have expressed their concern about the conditions of the deportation as many of the deportees are stripped of their goods and trucked thousands of miles across the desert. Algerian authorities have launched a black man-hunt in the country amidst a wave of anti-migrant populism espoused by senior political figures in the country, including the Prime Minister and the foreign Minister. Several human rights watchdogs, including Amnesty International, denounced the racial and discriminatory crackdown on sub-Saharan migrants, who are forcibly expelled. Over the past three weeks, more than 2,000 Sub-Saharans were expelled to Niger and Mali. Last week, Amnesty International deplored that Algerian authorities proceeded to arbitrary arrests on a basis of racial profiling, as they did not seek to ascertain whether the migrants had the right to stay in the country, either by checking their passports or other documents. Some of those arrested and deported are undocumented migrants, while others have valid visas, AI said. In their crackdown on migrants, Algerian authorities even banned them from using public transport means. Strikingly, Algerian officials, including Prime Minister Ahmed Ouyahya, Foreign Minister Abdelkader Messahel and presidential advisor and Head of Algeria’s human rights commission Farouk Ksentini, joined the xenophobe movement, making outrageous statements targeting sub-Saharans. These officials accused the migrants of spreading HIV and diseases in Algeria, and of being a source of anarchy, crime, drugs trafficking and other calamities. A large segment of Algerian society followed suit, spreading hate on social media. Recently, a Twitter hashtag “#cleaning Africans off Algerian cities” was launched by local anti-migrant activists. According to unofficial figures, there are an estimated 100,000 African migrants in Algeria. Posted by Emmanuel Agbenonwossi on October 30, 2017. Filed under Zoom. You can follow any responses to this entry through the RSS 2.0. You can skip to the end and leave a response. Pinging is currently not allowed.